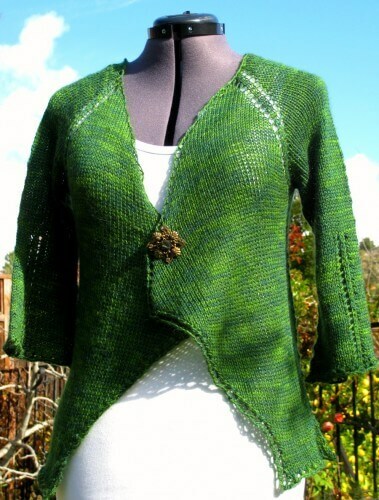 At VKLive in Chicago earlier this month, I happened upon a booth where all the women in it were wearing a cardigan of Ann Weaver‘s design, called Monomania. I fell instantly, dangerously, in love. I loved the way it fit every body working the booth. 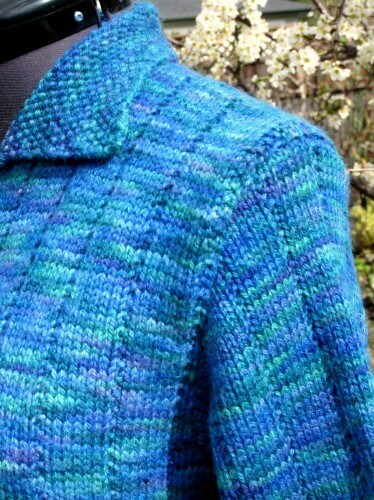 I loved the varied palettes each knitter had chosen. I loved the thoughtful, mathematically elegant, figure-flattering design – these are all characteristics I strive to achieve in my own designs, so I definitely appreciate them in others’. 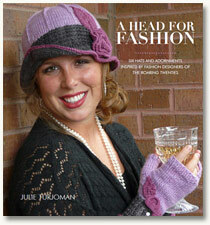 The problem is, I seldom have time to knit someone else’s pattern. But Monomania… Well. Here are the first few inches of my version, with the color palette in deep greens and blues sparked by chartreuse. Still in love. Can’t knit fast enough. Meanwhile, having completed all twelve of the designs for my upcoming knitting book, the reason I can knit my own Monomania is that until the end of this year I “get to” knit whatever I want. 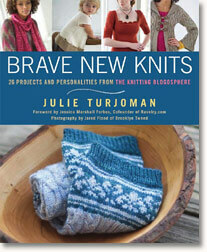 As soon as 2014 rolls around, however, I’ll be working on a new set of designs for another knitting book project. 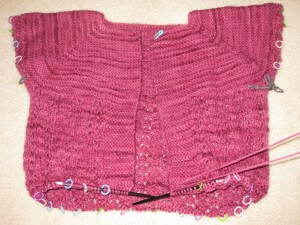 Making progress on the Gyroscopic Cardigan, having finished the sleeves and back last week, shaping and all… am absolutely loving the way two repeats of the charted motif create a third one up the center. Here’s another view. The twisted stitches and minimal cable crossings create wonderful texture up the back, undulating from ribbed hem to neckline. The larger sizes will include widely-spaced ribbed borders that frame the central cable motif, adding interest to those side stitches that allow room for the waist and bust shaping. One of the many things I love about this cable motif is how easily it is memorized. 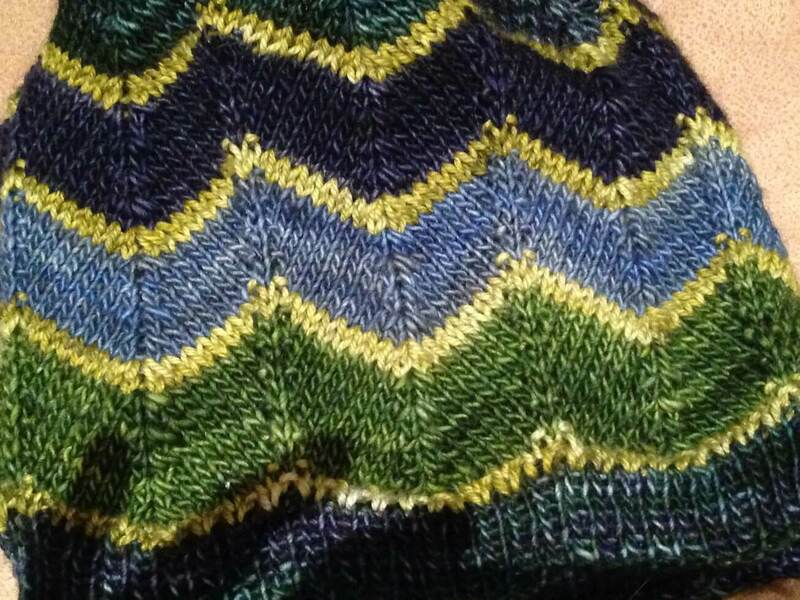 Once you get into the rhythm of the curves, it just flows off the needles. 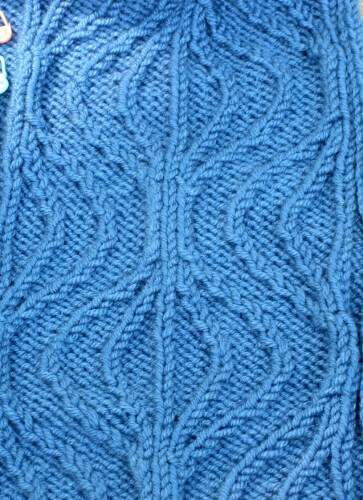 While my pattern for the cardigan (being test-knit as I write) will include line-by-line directions for the cable motif, written out in meticulous detail for knitters who prefer that format, I am a chart fanatic myself, and find charts so much easier to work from. Decided to keep the sleeves simple, referring to the widely-spaced ribbed outer swirls of the cable motif as a way to add interest but not let the sleeve design get too busy. Although you won’t hear me say this very often, sometimes the simplest solution is the most elegant. 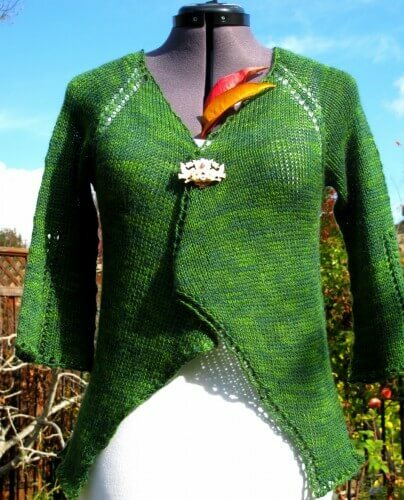 And set-in sleeves are definitely the way to go with this cardi. 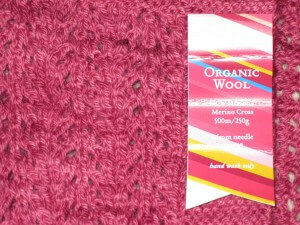 The heavy worsted weight yarn creates a fabric that demands the structure of seaming. Taking advantage of last week’s warmish weather, I was able to knit outside on the terrace quite often and keep up with the evolution of the garden. Not that I accomplished any weeding (the Gyroscopic Cardi demands my complete attention, of course…) but I could still delude tell myself that I was making mental notes of the work that needs to be done outside, just as soon as there is a break in the knitting. Not that there are many of those. 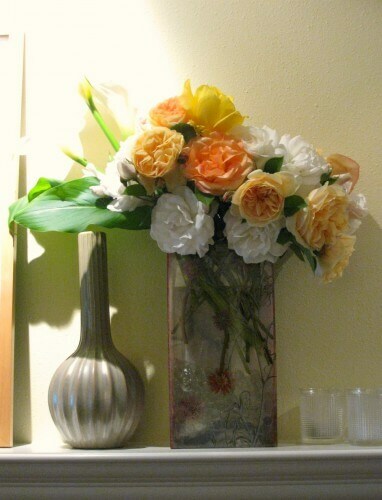 The bouquet below features four different kinds of roses, as well as calla lilies and their leaves. With so much secret knitting kept necessarily under wraps, it has been quite some time since I last had the opportunity to design a new sweater for yours truly. 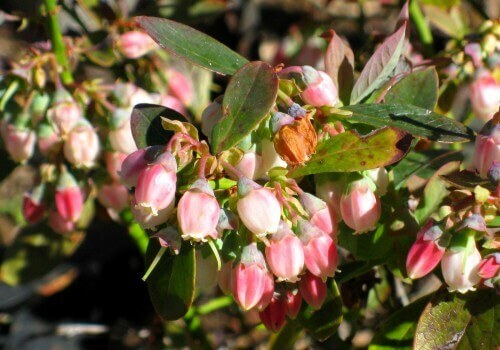 In fact, it has been a long time since I could blog about anything more exciting than baby caps, of which I have been enamored lately both for their stash-busting properties and for their “instant gratification” factor. But finally I’ve found a little window, and have thrown myself into the design of this new cardigan. Cardis are my favorite garment, cables are among my favorite stitch textures, and a full bag of this extraordinarily beautiful blue bulky weight yarn (Queensland Collection Uruguay Chunky, a sublimely soft and decadently dense blend of merino wool, alpaca, and silk) has been burning a hole in my stash. 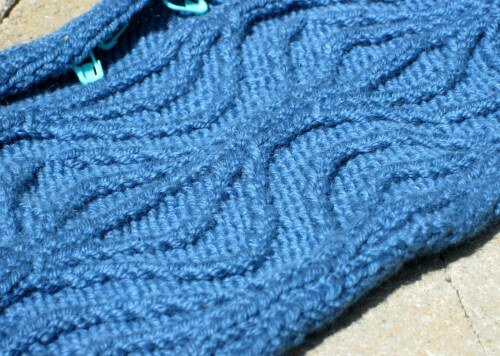 After much tinkering and swatching, I’ve decided upon this combination cable and twist pattern that creates a lovely gyroscopic swirl, hence the name I’ve chosen for the project. 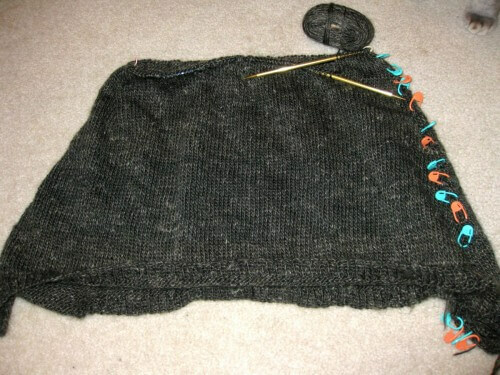 It’s exciting to see the pattern grow, and so far I am thrilled with the way the shaping of the cardigan is evolving. On US Size 10 needles, it’s moving along quite nicely, too; a couple of days of intensive effort as time permits and the front pieces are nearly complete. Follow along with me; I’ll post updates on the progress as long as it takes. I quickly realized that the 10 skeins I already had of this yarn were not going to be quite enough to complete the cardi I envision unless I made it with cap sleeves. I’ve ordered a few extra skeins and assuming the dyelots are not a perfect match, will have to alternate skeins as I work the back and sleeves. But we have a winner nonetheless. Down to two options (nobody seemed to care for the clear cut glass buttons), the brass bunches of cherries or these green resin ones, I finally settled on the green. 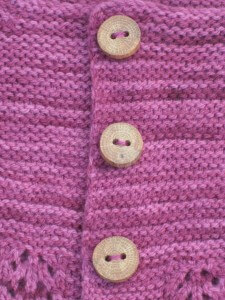 The brass ones seemed like overkill once I decided to applique the little crocheted bunches of cherries to the fronts of this cardigan. 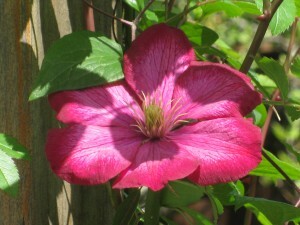 And the green ones, in their simplicity, do not detract from the crocheted appliques in any way. In addition, I really like the way they pull the green out of the variegated yarn; they keep the pinks and lilac colors from overwhelming the knitted fabric. So thanks to all who weighed in with their choices. It helped, it really did! 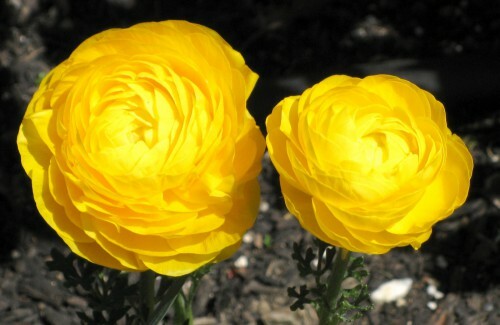 In and around the garden over the weekend, the ranunculus continued to glow in that amazing saturated golden color, catching my eye every time I pass them. 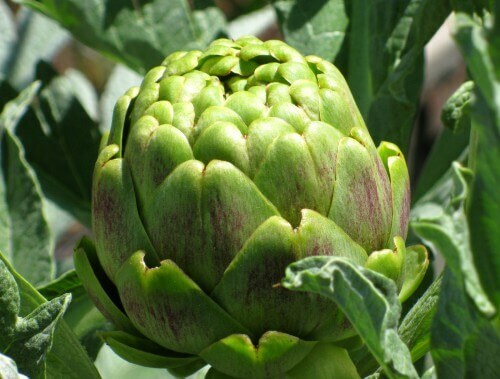 To my amazement, the first of the artichokes are already up in the vegetable garden. They seem really early this year! Because we have so few of the plants (they take up a LOT of space in the raised beds, and I had room to plant only 5 of them), and they seldom ripen all at once, there are never enough of the large globe ones for everyone, and often just a handful of the secondary babies. Rather than fight over them, I buy a package from Trader Joe’s to supplement those from the garden, and that way everybody is happy at dinner time. 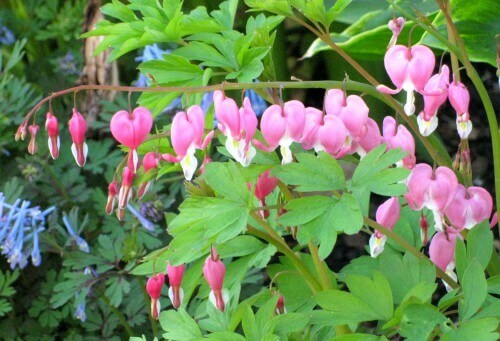 Of all the old-fashioned flowers planted in the garden, I confess that these bleeding hearts are among my favorites. 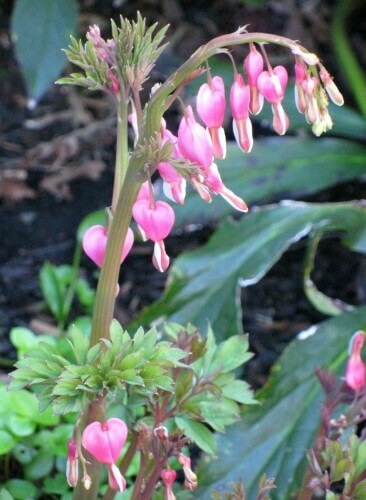 Not only are they gorgeous in a delicate way, bu they return year after year. And now to plot out my evening, the highlight of which will be the first episode of the new Upstairs Downstairs (yes, I miss that comma from the original series, too.) Having watched all of The Cazalets (based on a wonderful series of 4 novels by Elizabeth Jane Howard), and now working my way through the DVDs of Lark Rise to Candleford – both charming period drama series that serve to enhance an evening’s knitting – I am ready for a fresh, new series to begin. Lately, it seems as if everybody I know is having a baby. Some of my older friends have grown children who are starting families of their own. Some of my younger friends are adopting or bearing children at an alarming rate. Alarming only because I want to knit for all of them, but am simply not that productive. Yes, I know baby clothes are small, use less yarn, and ostensibly work up much faster than handknits for adults. This is often true, but when you’re a slow knitter like me sometimes you just have to bite the bullet and pay a visit to Baby Gap. 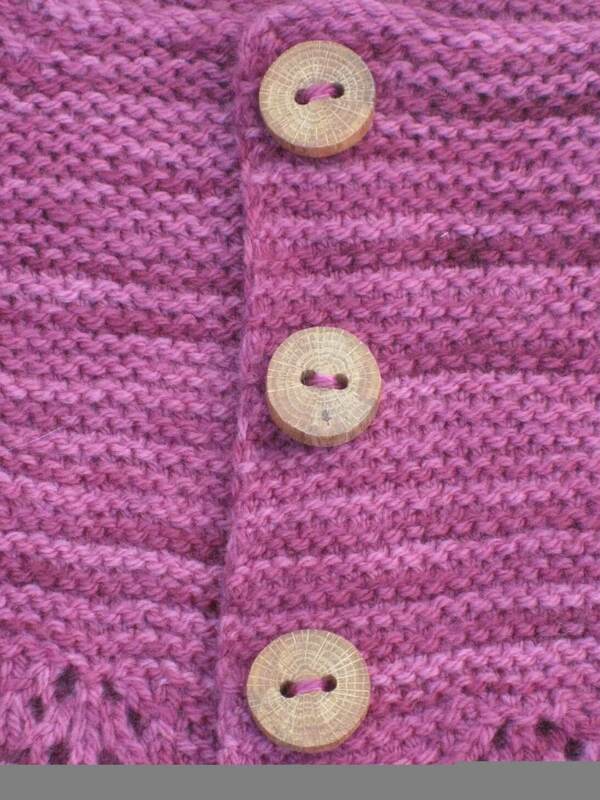 This particular item will be a cardigan for a new baby girl. 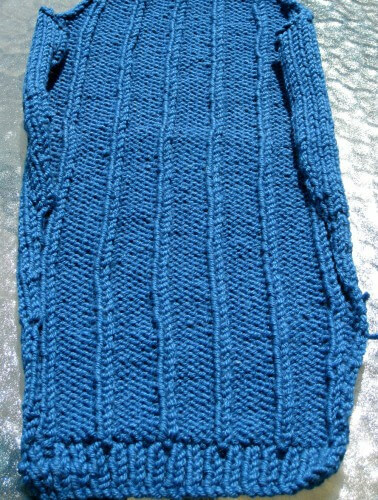 I started with the sleeves to make sure I’d be happy with the way this yarn knits up in the textured pattern. Sure enough, the effect is quite pleasing. 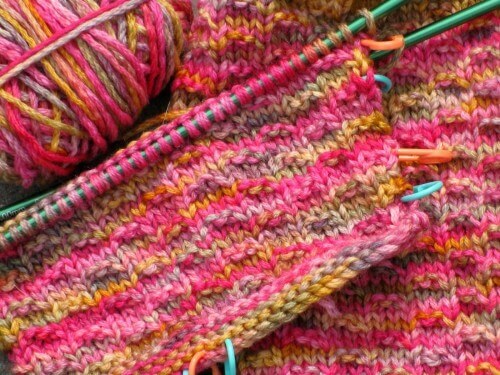 The texture masks any pooling of the Koigu Kersti yarn I’m using (US Size 6 needles, for anybody who is interested). I love these colors; they remind me of an especially vibrant tropical sunset. I even have plenty of skeins, having purchased enough to make an adult-sized sweater. In fact, I should have enough to make a couple of baby sweaters, with hats and booties to match. This Kersti has been in my stash for a long time, and although I quickly decided it wouldn’t work for me as an adult garment, it seems quite perfect for a child. When swatching with it long ago, I discovered that unless I am constantly vigilant, it splits quite horribly as the point of the needle goes into each stitch. Who needs that kind of headache? For a full-sized sweater, I don’t have the patience. But for a baby project, I can put up with it. Now to search through my stash for the perfect buttons! Every once in a while, I remember something I forgot. The Blue Pleated Cardigan is one of those. 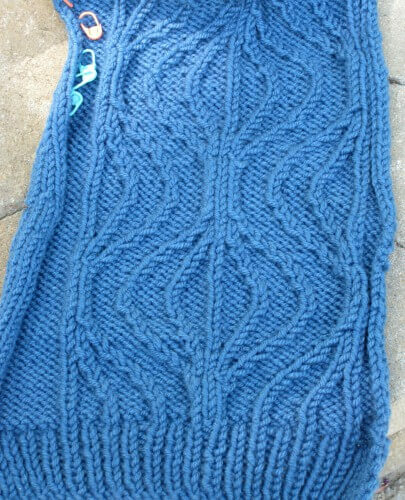 After I finished making it in 2009, I wore it to death for at least a year. Then, for reasons I no longer remember, I consigned it to the top shelf of my closet. That is to say, the shelf I can reach only if I stand on the kitchen step stool and reach up as high as my arms will go because that damned shelf is really high. The things that wind up there often don’t see the light of day ever again, or at least not often. But the other day, I was fishing around up there looking for something else, and I rediscovered my old friend the Blue Pleated Cardigan. Tried it on and wondered what I could have been thinking when I put it up there, because I still love it, it fits me just fine, and the yarn (which I’m pretty sure is Shaefer) is so soft and warm – perfect for this time of year. 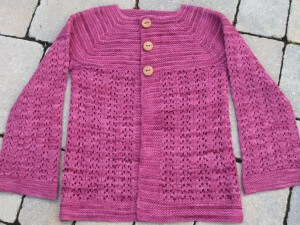 As detailed on Ravelry, this project evolved out of my desire to create a classic button front cardigan that combines supreme comfort with stylish design details. Seed stitch ruffled “pleats” fall gracefully over the hips and taper up into a bobble, from which point they carry up into the body of the sweater as widely spaced ribs. These pleats result in a feminine and flattering peplum effect that eliminates the need for any additional waist shaping. 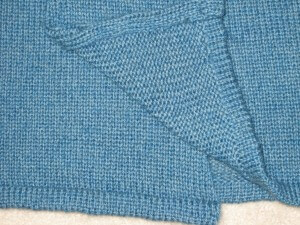 It is knit in pieces from the bottom up, with set-in sleeves that bell out at the ends due to the pleat detail. 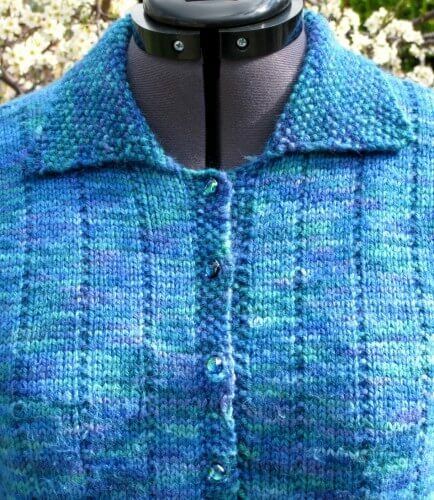 The seed stitch collar and button placket add texture that does not compete with the lovely shades of teal, green, and purple in the yarn. Gleaming art glass buttons were the finishing touch of which I was most proud; the colors in the glass are dead-on against the colors in the yarn. Not intending to self-publish this design, I never wrote up the pattern from my notes. 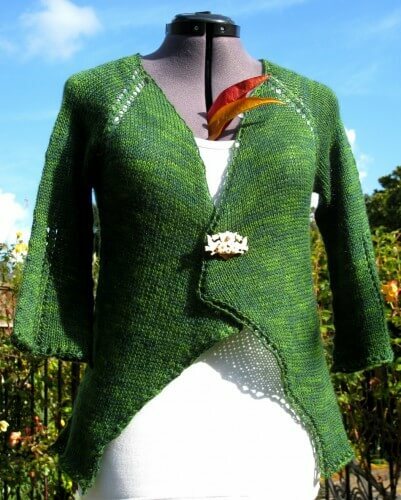 I could probably recreate the notes now and devise a pattern, but I kind of like the idea that this cardigan is one-of-a-kind! Having just completed writing up the pattern for a secret project, I needed something soothing to work on. Something a little bit mindless. Something mindless that would nevertheless result in a garment I will be happy to wear. 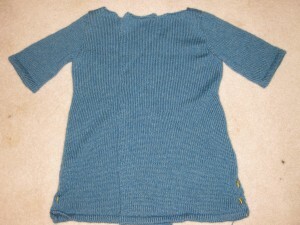 And that’s why I am Working up another of Cocoknits’ designs, this time the Louisa long-sleeved tunic. 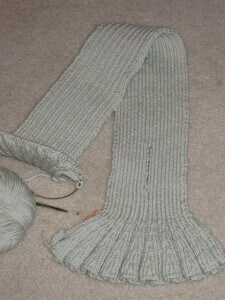 I really want to wear it over the holidays, so am knitting practically in my sleep during every spare minute. Knit in the round in Stockinette to the armholes, this is a relatively speedy project (relatively because as a tunic it is fairly long and that just takes more time compared to a sweater that ends at the hip). The Habu wool and linen roving is easy on the hands and knits up into a soft, drapey fabric. I especially like the deep, clay green colorway. Lovely! Even Shadow has offered to help (actually, she’d much rather play with the yarn but knows better than to try… who says cats can’t be taught?). 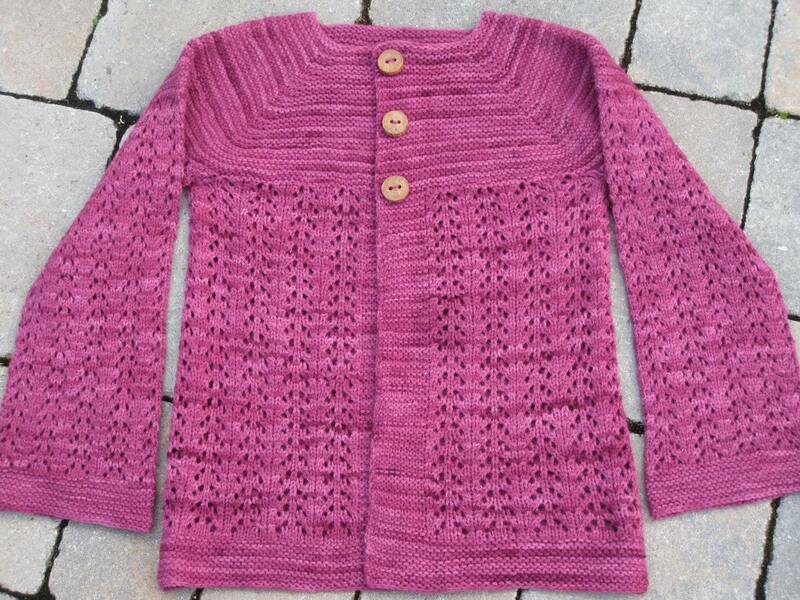 Another recent FO to share, Sabine is my first – and perhaps my only – knitted holiday gift for this year. Sabine is for my daughter, who goes to college in a cold-winter climate, who has coveted this yarn (Mountain Colors “Bearfoot”, a DK weight blend of wool, mohair, and nylon) ever since it first appeared in my stash, and who is the apple of my eye (as the saying goes). The creation of Julie Wiesenberger of Cocoknits, Sabine is a drapey cardigan knit seamlessly from the top down, with simple eyelet lace details that add a bit of hourglass shaping to the back and a gentle flare to the three-quarter length sleeves. In its own quiet way, it is a joy to make. 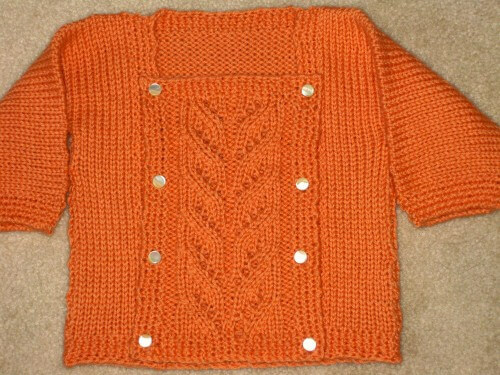 I first became familiar with the collection of Cocoknits patterns when Julie agreed to participate in Brave New Knits, (her Button child’s tunic is utterly adorable and equally easy to make) and was immediately drawn to the elegant simplicity of her designs. Yet, her patterns include graceful details and ingenious assembly techniques that make the finished garments look more complicated than they are. They are heavy on the stockinette, making them excellent projects for evenings when I may watch some TV and don’t necessarily want to work on more demanding projects. Those gorgeous leaves from our peach tree add just the right autumnal note, don’t they? Although none of my friends are having babies anymore, at least their own kids are. 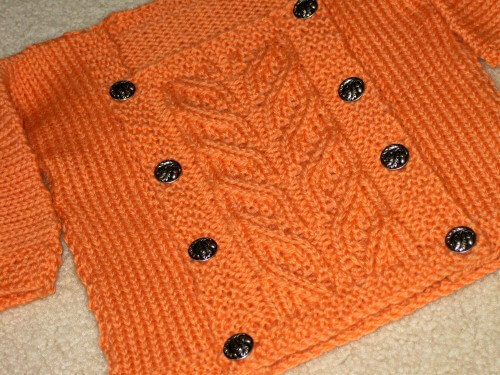 It’s so nice to have an excuse to knock out an adorable baby knit! 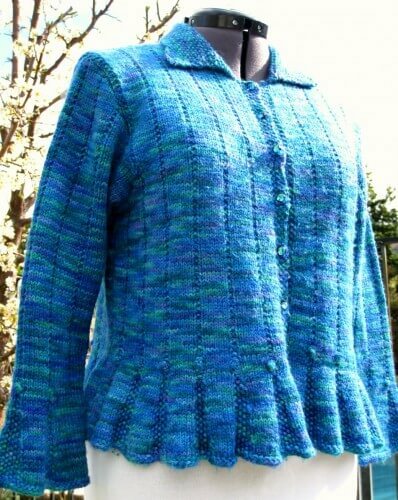 This sweet little sweater, based on a free pattern from Jimmy Beans Wool, is called the Presto Chango (by Valerie Wallis) and took one week to work up. 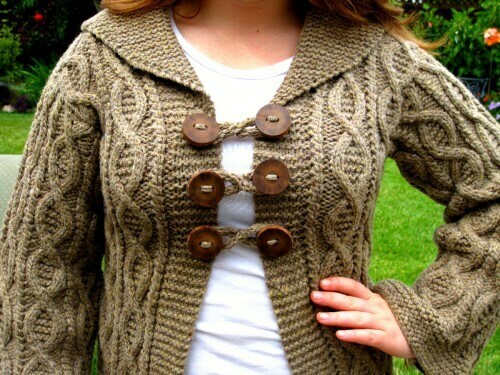 Seriously, it almost took me longer to choose the buttons than to knit it. These oak leaf and acorn buttons were a trial run, but ultimately determined to detract from the center lace panel. I don’t know the mother-to-be very well, so I almost did it more for Suzy because I knew she would appreciate it and make sure that it is cared for properly. That’s something we all hope for when we labor over hand-knits; there’s no joy in seeing it worn some months later by the baby’s toy teddy bear because it shrank in the wash, right? 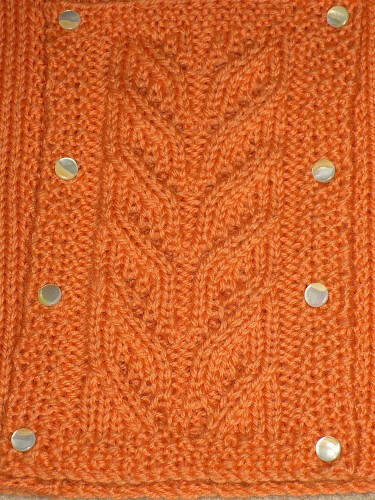 I try to include a label from one skein of the yarn (and in this case, the project required only two skeins of Elann’s Peruvian Collection Highland Wool in color #1004: Pumpkin. Now that’s what I call a cost-efficient project!). 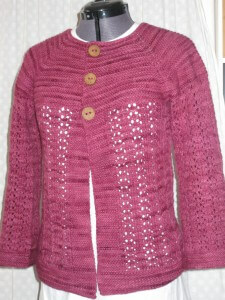 Finally, my February Lady Sweater is finito!!! Several months past my original self-imposed deadline, it’s true, but with the sudden spring cold snap we’re having here in the Bay area, I am wearing it right now and feeling very comfortable. 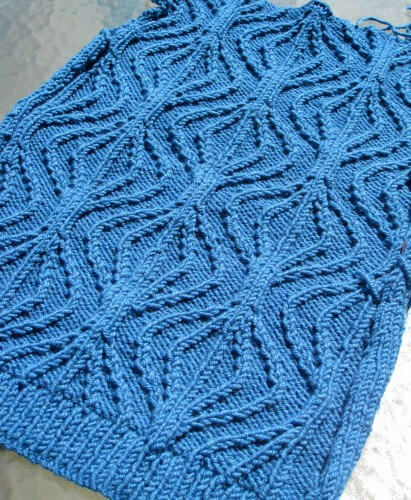 Pamela Flint’s pattern (or should I say Elizabeth Zimmermann’s?) 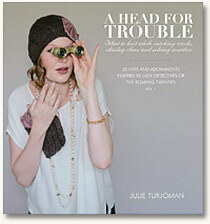 was a pleasure to knit up – oh, wait, I guess that’s DOWN, since this is a top-down pattern! Once the body was complete, I enjoyed trying out my 12″ long Addi’s for the sleeves. 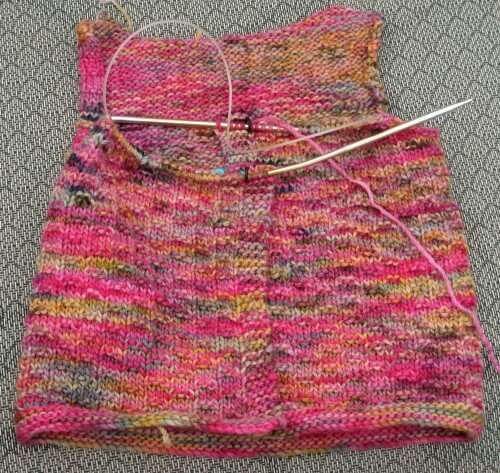 This was much easier going once I’d knit a couple of inches, and in fact for the second sleeve I began with my trusty dpns and switched to the circulars once I’d made a bit of headway. Does anybody else find this to be the case with the short circulars, or is it just me? I’ll try to get some modeled photos over the weekend, when my husband will be around to take a few shots. 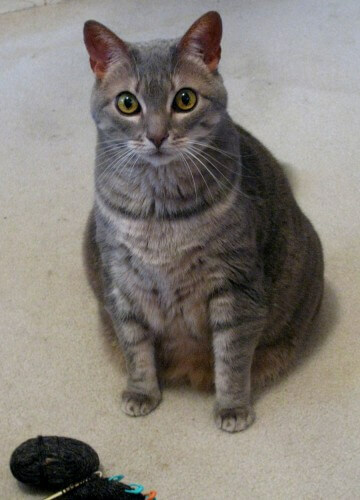 Meanwhile, trusty Grayce will have to be my stand-in. I love all the shawls and wraps in this issue, but the Abrazo shawlette by Susanna IC really captured my heart; I picture wearing it all summer either draped lightly over my shoulders or wearing it twisted as a wrap in my hair. Love the beading, love the open fabric, love the deep lace border. Any number of skeins in my stash of Sundara laceweight yarn would be well-suited to this project, as would the Woollen Rabbit laceweight, the Fearless Fibers laceweight….. maybe I’ll just have to make more than one version of it! Poplar & Elm by Carol Sunday is a masterpiece of lace, feminine shaping, and stylishness. 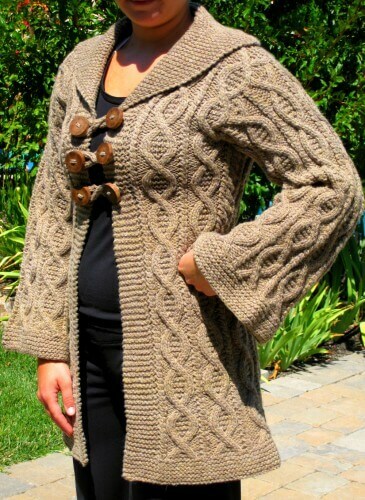 I love everything about it, and have a few different yarn options that would be lovely for it. 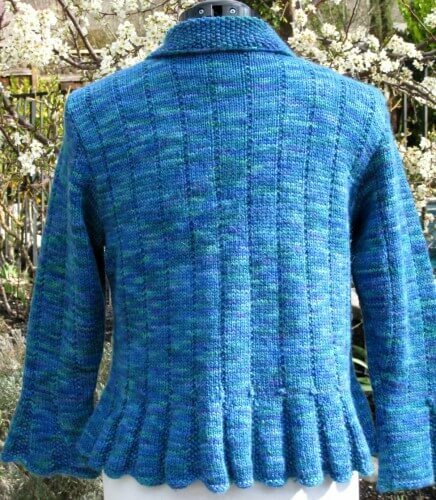 When I first saw the fabulous Timpani by Connie Chang Chinchio, I thought immediately of my stash of Elspeth Lavold’s Silky Wool, and of wearing it in the fall here in California, where that fiber blend is perfect for the climate. I just love the crisp military styling of this jacket, and although I might have to do a bit of regauging to accommodate the yarn weight (although knitting it on slightly smaller than recommended needles would give the fabric more stability), it would be worth the effort to have such a snappy garment hanging in my closet. So, no shortage of possibilities in this issue. Paging through the options makes me appreciate all the more the good company in which I find myself. 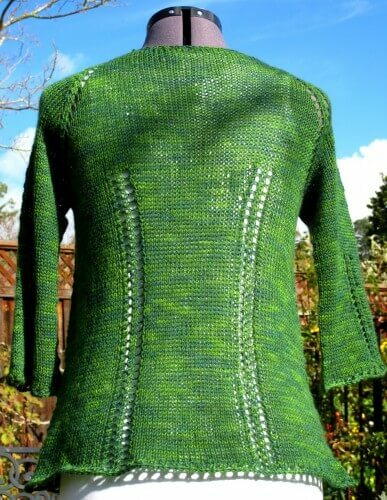 Comments on Ravelry regarding my Passiflora tunic have been interesting and enlightening. Some readers don’t like the thought of their bras showing through a garment and will consider omitting the side lace panels as a result. Some don’t think the A-line shaping flatters their figure type, and are likely to add waist shaping to their version of the design. 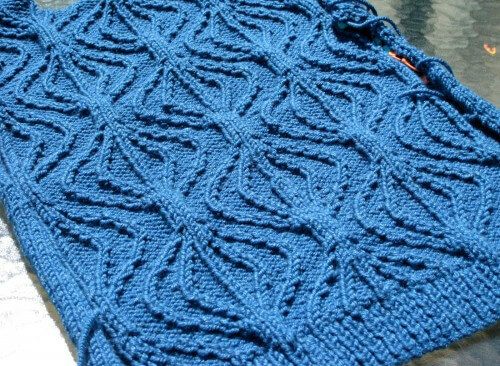 Since I modify nearly every project I knit that has been created by other designers, I can hardly protest when others see fit to alter mine – in fact, it’s this kind of dialogue, this realization of knitting’s infinite possibilities, that makes the craft so intellectually challenging, creative, and fulfilling. Despite an annoying lack of cooperation from my cranky, stiff, crampy, in-need-of-R-and-R fingers, there are a few projects in the works – more than I usually work on simultaneously given my inborn tendency, supposedly the fatal flaw of all Geminis, to get quickly bored and just cavalierly toss the incomplete projects into the “mañana” pile, never to be seen again not always to finish what I start. This scarf is nearly done – just half of the second ruffled edge remains, and then off it goes to my friend Diane in Washington in time for the holidays. This yarn, Classic Elite’s Cashsoft Baby DK, is absolute heaven to work with – soft, soft, soft. And the color, palest celadon, is gorgeous – much more calm and subtle than those I normally choose, making this project a restful and enjoyable departure. Yes, I succumbed to Lemming Syndrome, and am knitting myself a February Lady Sweater along with every other knitter on the planet! I finally decided that since the rest of the knitting world seems to have made this baby, there must be a good reason for its enduring popularity. Sure enough, it is quick (for anybody without my hand and finger issues, that is), has an easy-to-memorize lace pattern, and when working with the right yarn, it feels so good to see it taking shape exactly according to plan. Fleece Artist’s hand-dyed, 100% merino Organic Wool is a joy to knit with; squishy and blissfully soft. And you know me – the brighter the color, the happier I am; it’s the magpie in me for sure. This deep, juicy berry shade caught my attention at Santa Barbara’s darling shop Loop and Leaf, so much so that two skeins leapt into my tote bag and demanded to come home with me. I knew as soon as I saw it that it was destined to be my February Lady Sweater. 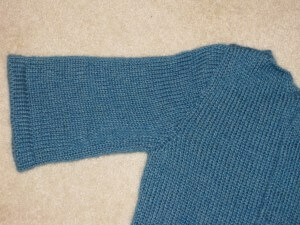 I’m still getting comfortable with the new knitting machine, and this cardigan is my first experiment. It is double-breasted and will have elbow-length sleeves, as well as a drapey, swirly collar, and possibly pockets once I figure out the best kind to use. 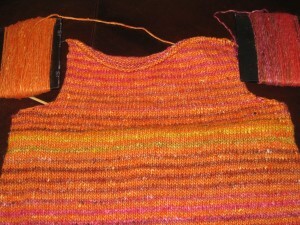 The back, fronts, and sleeves knit up breathtakingly fast – within three days, I was done. Stockinette goes pretty quickly anyway, but this was unlike anything I’ve evern seen. That yarn went through the carriage like the proverbial hot knife through buttah, and before I knew it even the back was done, shaping, decreases, and all. Amazing! Nifty technique for turned hem: slows me down a tidge, but the end result is so worth it. 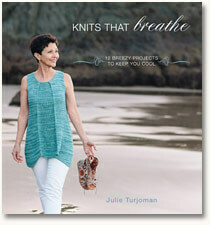 So yes, a whole lotta knittin’ goin’ on, just in case you suspected otherwise! Aside from the alarming fact that our pool is in danger of overflowing (seriously, the water level has risen a good four inches since last night), today’s downpour, high winds, and flash flood warnings have kept me happily indoors where I am working, knitting, reading, and fortifying my labors with cups of hot tea. My appointments for the day have all called to cancel – a sure sign that I was meant to stay inside. Which is not to say I am unappreciative of my good fortune. 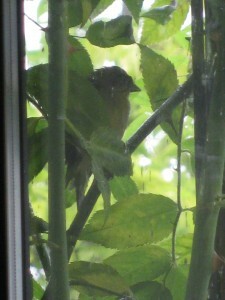 All I had to do was look out the window to see what I might have been up against had I ventured out into the storm. 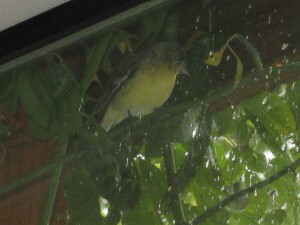 These little guys are perched within spitting distance of the bird feeder, but under the eaves they are protected from the rain. They’ve been drying and grooming themselves for hours, intermittently, then fly off only to get soaked again. I’ll stay put for the duration, although I thought I’d be meeting the knitting machine dealer this afternoon; she cancelled. I thought I’d be getting a back X-ray this morning (don’t ask), but they were running so behind schedule due to the weather that I postponed it. I thought I’d have to run to the post office and the grocery store, but a cursory look in the fridge and the pantry convinced me that there are plenty of options to choose from for tonight’s dinner. And the world won’t end if I buy postage stamps tomorrow. In other words, I’ve given myself permission to put off until tomorrow what I could do today – and I’m fine with that choice even though it’s a weird feeling not to HAVE to go out in this terrible weather. My raincoat and hat are at the ready by the back door, but now, suddenly, I don’t have to put them on. Today is a gift, pure and simple. 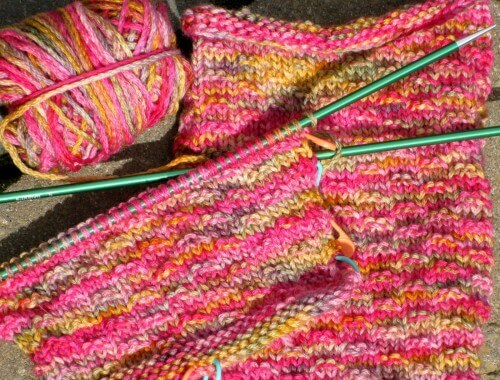 A gift of time in which to make slow, steady progress on re-knitting my striped sweater. I’ve worked a solid 6″ of the back, and have only 2″ to go. I take a break every 15 minutes to massage my hand, keep it warm, loosen the finger joints. The deep V-neck front should by rights take less time than the back, and then I’ll just have to reassemble the pieces and work the ribbed neck band. The end is not yet in sight, but not so very far away, either, thanks to this rainy day.